Manage your cloudified FireEye Email Threat Protection Cloud (ETP) without ever leaving the Avanan dashboard. 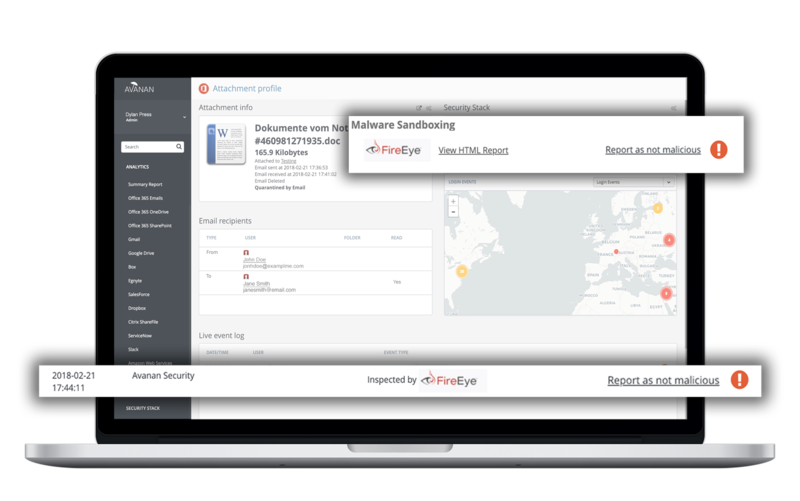 Avanan has partnered with FireEye to integrate its core malware sandboxing technology to run within the Avanan platform, with no need to configure the ETP product. The FireEye Email Threat Protection Cloud (ETP) is deployed instantly. Quickly identify risk level and minimize false positives based on in-house threat intelligence. Block threats, manage policies and automate responses to reduce risk with no additional overhead. Detect malware threats that other solutions miss. Protect against known and unknown zero-day malware.